The Grey in one word: Intense. A group of oil drillers heading home to Anchorage, AK, is stranded in the snowy wilderness when their plane crashes in the middle of nowhere. Only a few men survive and they quickly realize that the real threat is not freezing to death, but a pack of wolves who are intent on killing every last man. I have to admit that it was refreshing for animals to be the antagonists in this. It’s easy to forget living in cities and keeping pets that animals can often be a grave threat to humans––especially when we have no guns. The wolves were absolutely terrifying and I almost had a heart attack the very next morning when my neighbor’s huge black bear of a dog came bounding up to greet me when I stepped out my front door. He’s harmless, though, and so cuddly and lovable. But I digress. Terrifying wolves and lots of up close and visceral images of them devouring their human prey. Men who do hard work for a living and like to drink, fight and swear. The Grey definitely earned its R rating. Just the intensity in the shots alone got to me. Okay, I was sitting pretty far up front, so that may have had something to do with it, but they would shoot someone walking from behind and place the camera pretty much on their shoulder. And with the snowy environment, the look was very crisp and “in the moment.” I think I held my hands up to my face the entire time. And I was cold! It was fitting to watch this film in the middle of Minnesota winter, especially considering that one of our mascots is the Timberwolves. Now on to the actors: Liam Neeson. Gotta love him. He’s lately become the actor who plays guys who get things done. He has this Alpha male screen presence about him and presents a strength both emotionally and physically that few other actors today can match. In The Grey, Neeson plays Ottway, a man whose job it was to shoot the wolves near and around company grounds. He’s also grieving the death of his wife and a bit angry at God for taking her away from him. All of the men in this film are damaged and rough around the edges. They’ve made stupid mistakes and have paid dearly for them. It’s not really said so much as shown in their haunted expressions and the sarcastic front they put up in facing their fear. The other actors aren’t well-known (except for Dermot Mulroney (My Best Friend’s Wedding) who is unrecognizable behind a thick pair of glasses), but for a frequent movie watcher like myself it was fun to see “that guy from Becoming Jane and Across the Universe!” (Joe Anderson) and “that guy from 3:10 to Yuma!” (Dallas Roberts). Frank Grillo was a standout as Diaz, a guy who at first has trouble admitting he’s afraid and then has a rather poetic if sad end in front a gorgeous mountain vista. 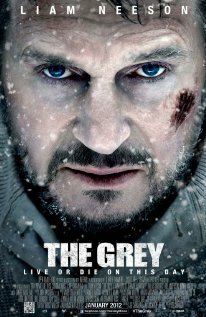 The Grey is a survival movie with themes revolving around faith, emotional layers, how men deal with life, etc. It was interesting to me that they really didn’t immediately put their full effort into defeating the wolves, and I wondered how different they would have behaved had there been women present. The last man standing really only gets his fight in gear at the bitter end when it’s pretty much all over and he’s literally in the wolves’ den. He wants to die from grief but can’t quite let himself do it, at least not without a fight. Speaking of that, the movie’s tag line is: “Live or die on this day.” It’s something we are all faced with every morning we wake up: Are we going to roll over and let death take us, or do we still have one more good fight in us? Like his character we often get angry with God whether we say we believe in Him or not. And sometimes we shout at the sky and ask for a sign and get no better response than our God-given ability to fight for a few more minutes of life.